Nicolas Seidler is Senior Policy Advisor at the Internet Society. He joined the organization in February 2010 and currently leads ISOC’s work on Internet and Human Rights issues. He also engages in key global Internet governance issues and processes. Here he writes about the Freedom of the Net Report released on November 14, 2017. As more people get online everyday, Internet Freedom is facing a global decline for the 7th year in a row. 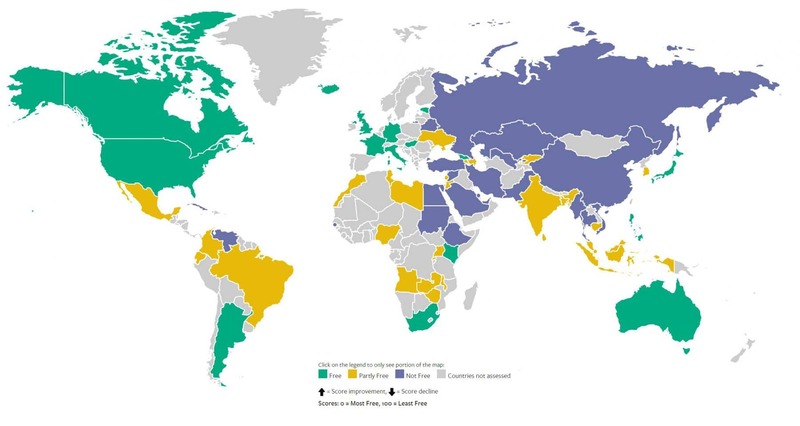 On November 14, Freedom House released their 2017 Freedom on the Net report, one of the most comprehensive assessments of countries’ performance regarding online freedoms. The Internet Society is one of the supporters of this report. We think it brings solid and needed evidence-based data in an area that fundamentally impacts user trust. Elections prove to be particular tension points for online freedoms (see also Freedom House’s new Internet Freedom Election Monitor). Beyond the reported trend towards more sophisticated government attempts to control online discussions, the other side of the coin is an increase in restrictions to Internet access, whether through shutting down networks entirely, or blocking specific communication platforms and services. These Internet shutdowns are at the risk of becoming the new normal. In addition to their impact on freedom of expression and peaceful assembly, shutdowns generate severe economic costs, affecting entire economies and the livelihood of tech entrepreneurs, often in regions that would benefit the most from digital growth. We need to build on these numbers as they open a new door to ask governments for accountability. By adopting the U.N. Sustainable Developed Goals (SDGs) last year, governments of the world have committed to leveraging the power of the Internet in areas such as education, health and economic growth. Cutting off entire populations from the Internet sets the path in the wrong direction. Mindful that there is urgency to address this issue, the Internet Society is releasing today a new policy brief on Internet shutdowns, which provides an entry into this issue, teases various impacts of such measures and offers some preliminary recommendations to governments and other stakeholders. Of course, this can only be the beginning of any action and we need everyone to get informed and make their voices heard on shutdowns and other issues related to online freedoms. Read the new Freedom on the Net report and pay particular attention to country reports relevant to you. Ask people to spread the word that Internet shutdowns cost everyone. Governments should stop using Internet shutdowns and other means of denying access as a policy tool: we must keep the Internet on. Tweet using #ShapeTomorrow and #NetFreedom2017. You’ll find more tweets on the Internet Society’s Twitter account. Read the Internet Society’s new Policy brief on Internet shutdowns, and look back at our paper on Internet Content Blocking for a deeper technical assessment on some common content filtering techniques. Read again ISOC’s findings on personal rights and freedoms from our 2017 Global Internet Report.